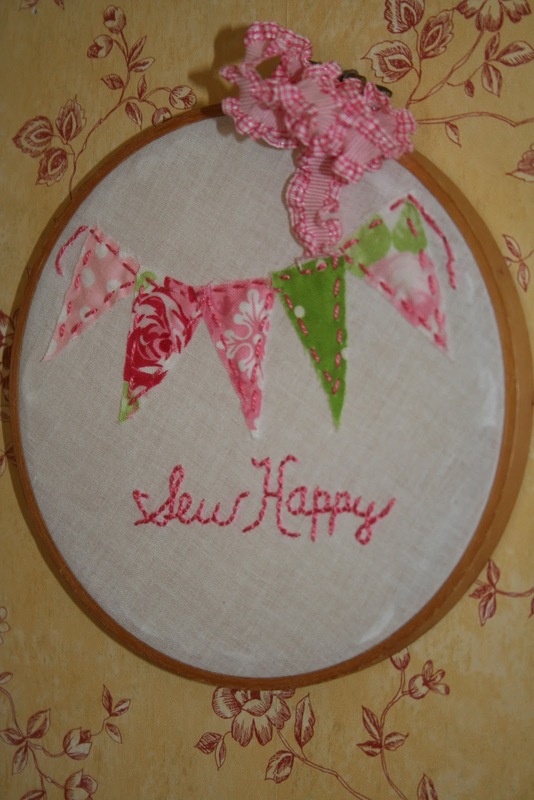 Sewn With Grace: Sew Happy! This lovely little hoop came from Shann at Daisy's Are My Favorite Flower. It was a fun birthday surprise she made for me. Shann's right, I'm sew happy! I have a little story to tell you about Shann and I. It's a story of God working and God revealing. I love it when He allows us to see His hand in our lives. A couple years back, Shann lived in another state and she started reading my blog. Her husband had a job change and it brought them to Michigan. I blogged one day about a barn sale I was involved in and she figured out it was not far from her. So to my delight, she came to the barn sale and introduced herself. I was so thrilled to meet a blogging buddy. When I asked her where she lived now, she told me. I'm certain that my jaw remained on the ground the whole day - she lives about 5 minutes from my house. One Sunday later I turned around to find her and her husband at the church we attend. We both broke out in giggles. It was confirmed, we were to be friends. I don't get to see Shann often as she is a working lady with a busy household, like me, but when we do get together, we talk as if we've known each other forever. We may have only known each other for a short time, but one thing is certain, God has known forever that we would be friends. Don't you love it when God does that? Very lovely gift and what a neat story! I love that. It is something as you said, to see the hand of God work in peoples lives. That is such a wonderful story. I smiled when you got to the part where she lives five minutes away, I was hoping she would end up nearby. I'm happy for both of you! I also wanted to tell you that I think your blog looks wonderful. Keren is so talented. Anything yhat girl touches turns to gold, I just love her!! Have a wonderful day my friend! Good friends are always special! I must share a story. Three summers ago my son went as a counselor to a church camp. He met "Jennie" (my age) who was also a counselor. He kept telling me that I would get along great with Jennie. She also happened to have a son my son's age. Fast forward a couple of years and she shows up at my Monday night bible study. We were at college together but never met, have mutual friends, and just have the best time. My son is thrilled, I am thrilled, and I hope Jennie is thrilled! Oh such a pretty gift.The story is so special.Gods hand is in everything,I feel so sad for people who dont really believe in God. Have a delightful day Renee! How cute is that. So perfect for you. It is so fun meeting blogging friends. 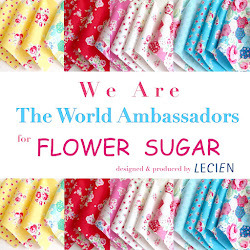 That is such a sweet story about you and your friend and I agree that God puts special people in our lives whether it is real life friends or bloggy friends. How sweet! I love meeting blog friends. I've had planned meetings, but the most fun ones are when someone comes up to me and says, "Are you Susan?" and then tell me they read my blog - so fun! I love your friendship story! Love the story, thanks so much for sharing. I love blogging friends! A very lovely story and a very lovely gift. Knowing how and when to bring people together in the most unexpected ways...we have such a loving God, don't we? What a neat story so clearly orchestrated by God! What a blessing to meet each other. Also, such a lovely gift! In Him there are no coincidences! What a cute gift and even better a new friend.